Beginning in 1901 Angels Flight Railway served as a vital economic connecting point between the citizens of Bunker Hill and the historic core of Downtown Los Angeles. For just a penny a ride, residents could take a short ride on the rail to the jobs and markets that awaited them below, and by the early 1950’s an estimated 100 million passengers had utilized Angels Flight during the course of it’s lifespan. However, by the 1960’s the landscape of Bunker Hill had changed, with new mixed-use construction on the rise many residents having moved out of DTLA to the suburbs. By 1969 Angels Flight was closed (for the first time). In 1996 a decision was made to reopen Angels Flight one block over from its original location, and in 2000 it was added to the National Register of Historic Places. Unfortunately, safety issues have plagued its operation, most notably a 2001 incident that killed an 83-year-old woman and injured 7 others. Angels Flight was subsequently closed for 9 years while the safety concerns were addressed, then reopened in 2010, and then closed (again) in 2013 after another incident that resulted in injuries to one passenger. Despite the issues, many remain committed to getting Angels Flight restored and operating once more, seeing the historic landmark as a important window into the history of downtown Los Angeles. 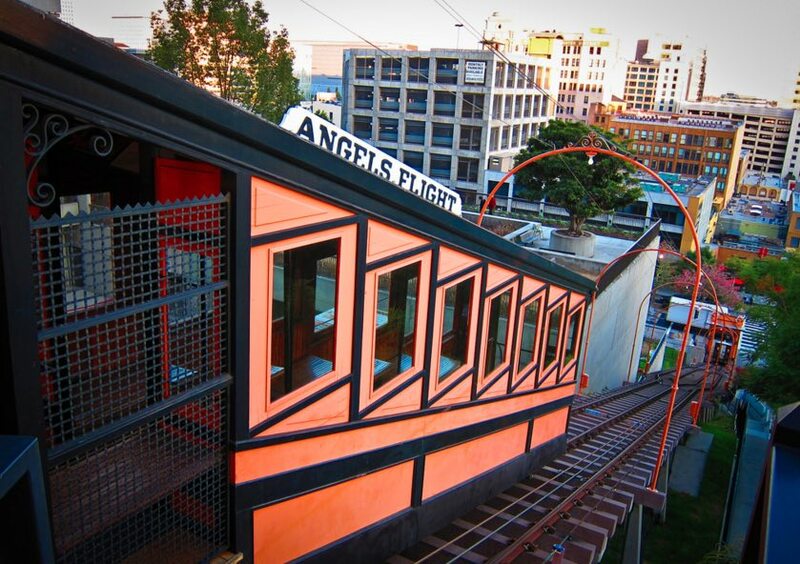 Enter the The Angels Flight Railway Foundation, an organization created to help find a solution for the funicular’s regulatory issues and ensure budgeting is secured to meet the estimated $360,000 annual operating cost. On November 5 the foundation is throwing a fundraiser / movie screening promising “cinematic thrills and historical enlightenment” at the Million Dollar Theater in downtown L.A.
A 45-minute illustrated talk about the lost Victorian neighborhood of Bunker Hill and Angels Flight’s vital role to that community. A screening of the Film Noir classic “M” (Joseph Losey, 1951), which featured location photography on Bunker Hill and in the Bradbury Building (see clip below). Tickets are $35 a piece, and can be purchased here. All proceeds from the event will go to the The Angels Flight Railway Foundation. Event to take place from 7:00pm – 11:00pm on November 5, 2015. The Million Dollar Theater is 307 S Broadway, Los Angeles, CA 90013.